One thing that I truly miss from the US is being able to find a good steak in a restaurant. There are a few places here to get one…and from my point of view the best place to get one is at our house. I just might be a bit biased on this one though. 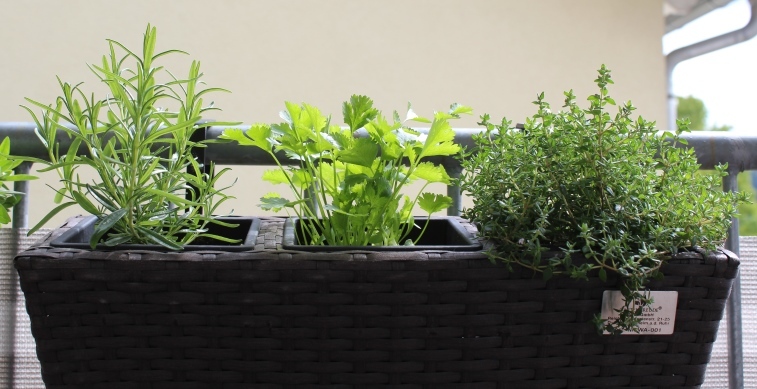 While I also love the huge variety of fresh herbs that are available in the grocery store here, this summer I planted a bunch of my own both in the retaining wall in our backyard and for the more frequently used ones (rosemary, cilantro and thyme) I planted a windowbox on our balcony. If you know me, the most amazing part about this is that I have managed to keep them alive with the assistance of the German weather for an entire month! Oh…and maybe a few of these would help too! 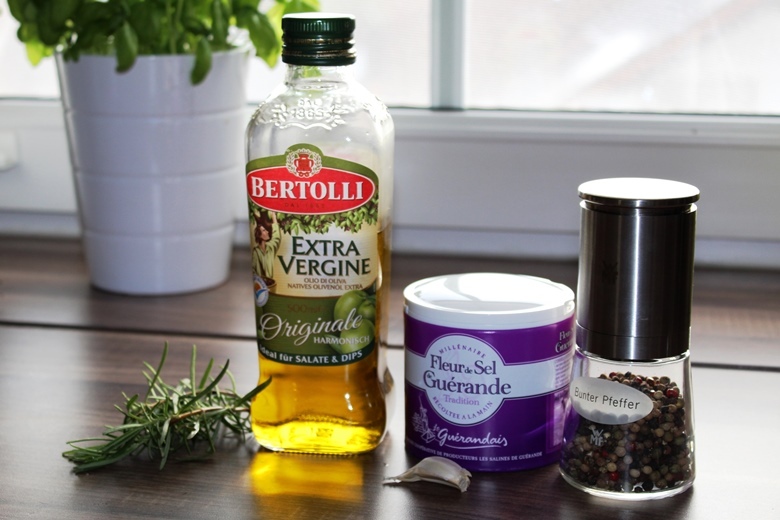 First, mince up a bit of the rosemary until you have about a teaspoon of very finely minced rosemary. 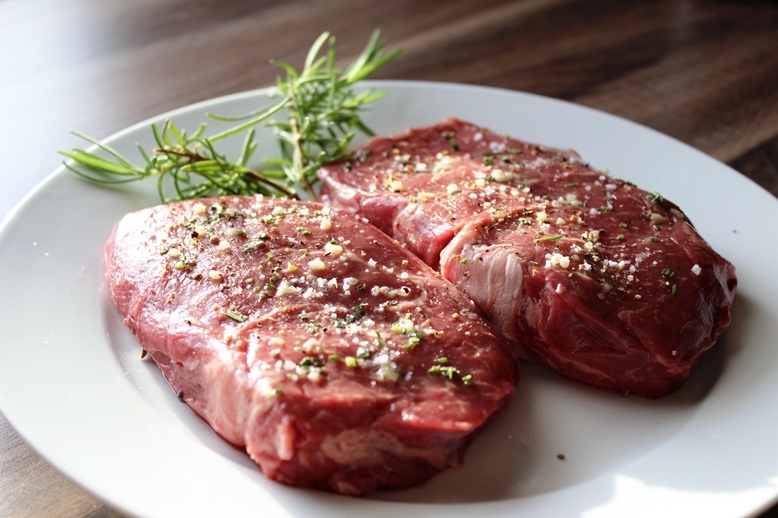 Prepare the steaks by drizzling a bit of olive oil over them, then sprinkling with sea salt, fresh ground pepper, finely minced rosemary, and crushed garlic. Rub the seasonings in to the meat, and then repeat on the other side. Let the steaks rest while you fire up the grill. The gloves are a must have too! 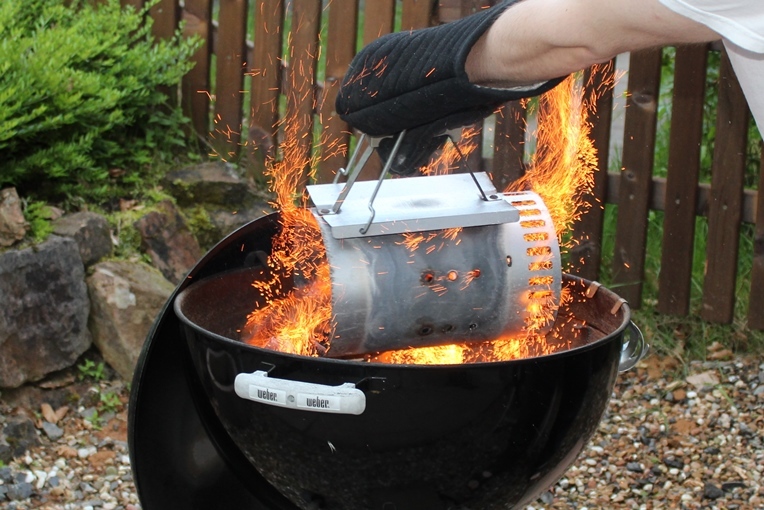 Once your grill and grill surface are heated up, sear the steaks on both sides over the direct heat. Once seared, move them to the indirect heat until they reach the desired doneness (Rare 130-135 degrees, Medium Rare 140 degrees, Medium 155 degrees, Well done 165 degrees). We served this with a sundried tomato butter (recipe to follow soon! 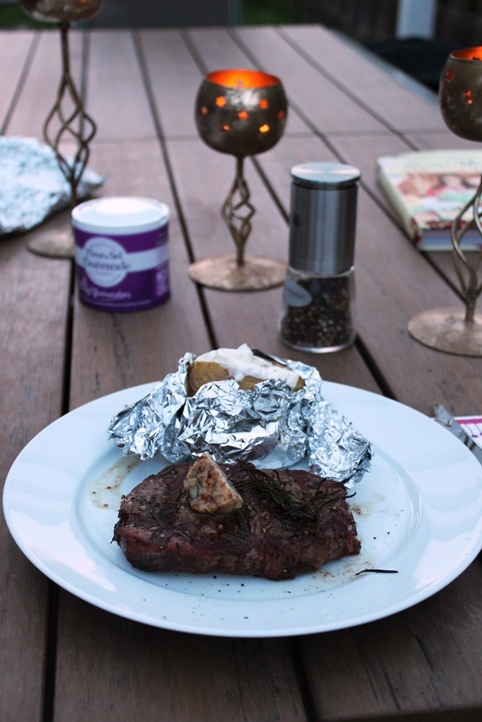 ), and since the steaks are pretty big we had just a run of the mill small baked potato with butter and crème fraiche on the side. Yum! Mince the fresh rosemary. 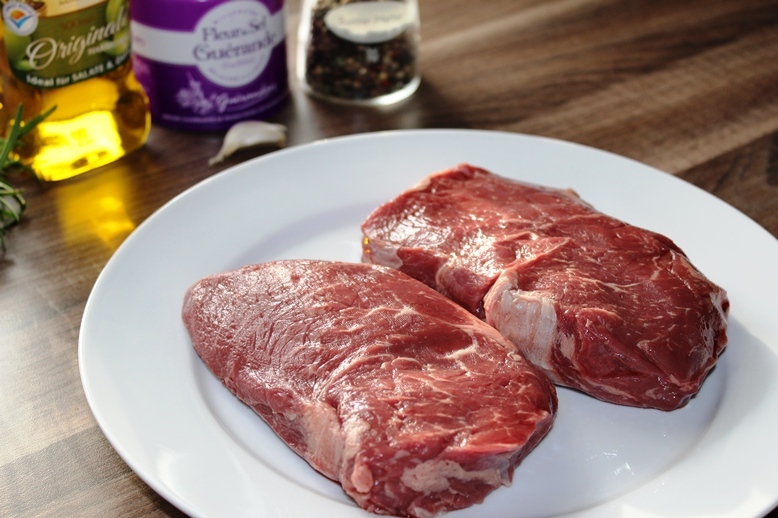 Drizzle the steaks with olive oil, then add the minced rosemary, crushed garlic, sea salt and ground pepper. Repeat on the other side. 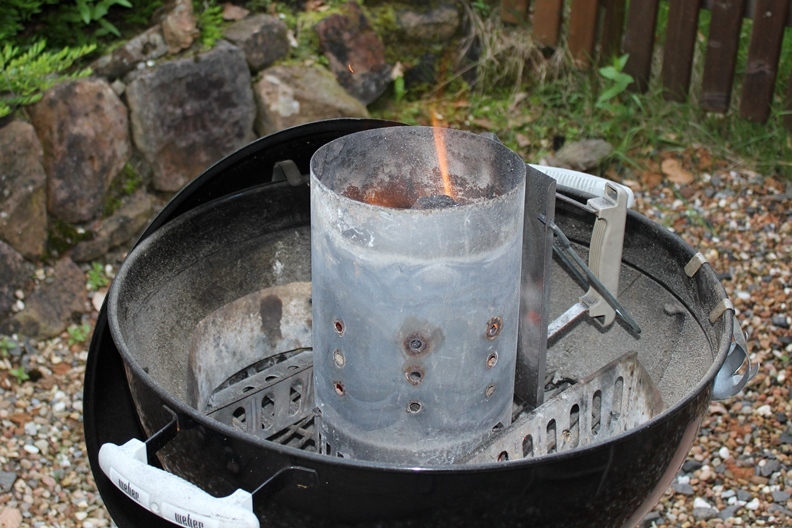 Fire up your grill and let the steaks rest on your counter while heating it up. When the grill is heated sear the steaks on each side over direct heat, then remove them to the indirect heat to bring them up to the temperature for your desired level of doneness (Rare 130-135 degrees, Medium Rare 140 degrees, Medium 155 degrees, Well done 165 degrees). Let the steaks rest for 2 minutes before cutting them. Enjoy!